Out of 238 million American adults, 100 million live with chronic pain. And yet the press has paid more attention to the abuses of pain medications than the astoundingly widespread condition they are intended to treat. Ethically, the failure to manage pain better is tantamount to torture. When chronic pain is inadequately treated, it undermines the body and mind. Indeed, the risk of suicide for people in chronic pain is twice that of other people. Far more than just a symptom, author Judy Foreman writes, chronic pain can be a disease in its own right-and it's the biggest health problem facing America today. Published in partnership with the International Association for the Study of Pain, A Nation in Pain offers a sweeping, deeply researched account of the chronic-pain crisis, from neurobiology to public policy, and presents practical solutions that are within our grasp today. Drawing on both her personal experience with chronic pain and her background as an award-winning health journalist, she guides us through recent scientific discoveries, including genetic susceptibility to pain; gender disparities in pain conditions and treatments, perhaps linked to estrogen; the problem of undertreated pain in children; the emerging role of the immune system in pain; advances in traditional treatments such as surgery and drugs; and fair-minded assessments of the effectiveness of alternative remedies, including marijuana, acupuncture, massage, and chiropractic care. For many people, the real magic bullet, Foreman writes, is exercise. Though many patients fear it will increase their discomfort, studies show it consistently produces improvement, often dramatic. She also explores the destructive "opioid wars," which have led to a misguided demonization of prescription painkillers. Foreman presents a far-reaching but sensible plan of action, ranging from enhancing pain education in medical schools to reforms of federal policies across the board. 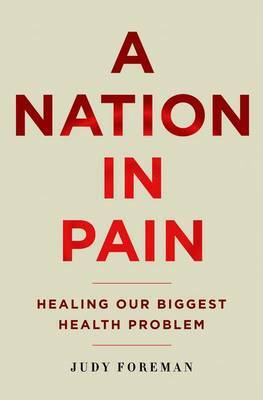 For doctors, scientists, policy makers, and especially patients, A Nation in Pain is essential reading.